General Dentist Santa Monica: Should YOu Get Your Wisdom Teeth Out? Wisdom teeth are our third set of molars that are most commonly known for coming in during the late teens to early twenties. While it was not and is not always required to have these teeth removed, over time our jaws have shrunk, making it more common than not for a person to not have enough room for an extra row of teeth in the back of their mouth. This is why people tend to experience a lot of pain and discomfort when their wisdom teeth begin coming in and therefore, have to have them extracted. How can you know if your wisdom teeth are coming in before you begin to feel the pain, however? We’re going to tell you. Continue reading below to learn more about how you can know when it is time to have your wisdom teeth taken out. Not every single patient we see experiences the pain that is often associated with wisdom teeth coming in. Sometimes a dentist will even suggest that a patient’s wisdom teeth be pulled after seeing their x-rays. This is done because the dentist wants to make sure that overcrowding is avoided. If this is not done, the new wisdom teeth could push and move other teeth out of their current position once they break through the skin. There are several ways you can know when it is time to have your wisdom teeth pulled. The first is when overcrowding occurs. When this happens, teeth that were once straight begin to shift. Shifting teeth can cause a number of different problems such as moving one tooth in front of another, gum issues, and infections. Another sign it is time to have your wisdom teeth removed is pain. This is often the first sign that you are going to have to have the surgery. The pain is most commonly a dull and aching pain in the jaw. You may notice it even more when you are eating certain types of food that require more chewing like meats and root vegetables. Additionally, you may find that your teeth and gums are much more sensitive to cold or heat than they normally are. Another issue that occurs when a person’s wisdom teeth are coming in is impacted teeth. When there isn’t enough room for the teeth to come in, they will commonly grow at an angle, often not in the same direction as the rest of your teeth. When the teeth become impacted, it is suggested that you have them removed as quickly as possible as leaving them can cause serious issues for your oral health in general. What can you expect from a wisdom teeth removal surgery? 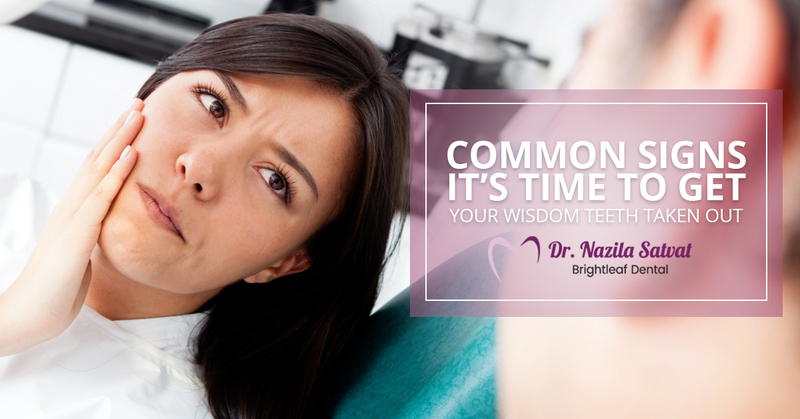 Since wisdom tooth removal is so common, it is unlikely that you will encounter issues if you choose to have the procedure completed when you first notice that your teeth are coming in. After the teeth have been removed, your dentist will use surgical dental sutures in order to close the wound so that it can properly heal. You will also be given something that will help to minimize the pain and the amount of swelling you experience after the surgery is complete. Additionally, your dentist will give you detailed instructions for caring for your mouth so that you can keep the wound clean and avoid infection. Healing from any sort of tooth removal is going to take a bit of time. With that said, if you consumed a diet of soft foods or even liquids for a couple of days, you will greatly speed up the healing process. Most often people are back to normal in two to four days. There is absolutely no reason at all to live in pain and since wisdom teeth removal is so common and quick, you cannot afford to not have it completed once your wisdom teeth start coming in. Waiting to have this procedure completed could lead to a lot of pain and potential infection and therefore, we would suggest you don’t wait too long. If you live in Santa Monica and you need a professional and friendly dentist to take a look at your wisdom teeth, we suggest you call us today at Brightleaf Dental and let us assist you sooner rather than later.